Discussion in 'Bug Reports' started by Myron W King, Jan 16, 2019. Have been running my server for a number of days now. I shut it down daily. When I went to fire it back up last night I got this error. I have since checked for updates and reinstalled RAT and 7d2d server with no luck. Can anyone point me in the right direction? Thanks in advance. I've been seeing more reports of this, but I don't have a cause yet. I'm still trying to figure it out/replicate it myself. Sorry for the trouble! You need to reinstall RAT clean to work again. But after that if you exit RAT the problem is back. It say some thing about net frameworking. This issue also starting happening. 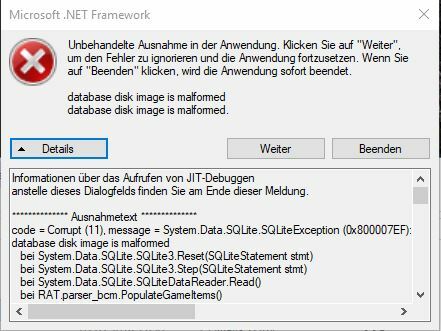 This is the second report of after updating .net framework of this happening... Not sure that's it, but... Still working to resolve it. Thank you for more information! Will repair the database. It seems as though its only the items table that is corrupting (still not 100% sure on that though). Regardless, if that does work for you, just click File -> Import Items / Blocks to rebuild that table. Hopefully that works until I can find/fix the issue. Can you tell me what file / files I should be looking into, and where. I uninstalled RAT and reinstalled, verified all files were removed when I uninstalled. So installing RAT again only gives same issue. OK, so I followed these instructions a couple weeks back and everything has been fine until today. When I booted up the server they error came back. I noticed this happened right after an update that took place last night. Can I just delete that file again? Yeah, you can delete the file. You'll lose your RAT setup though. But if you reconfigure it the same, you should be good (such as import your serverconfig.xml file). What update did you get that you think might be related to this? I didn't even pay attention to the update and I have my server pc shut down at the moment. Thanks for the confirmation though. I'll give it another try tomorrow. I had a Windows 10 error come up with my RAT ( Microsoft.Net Framework) Unhandled exception has occured in your application,Click continue to ignore error. After continue my Rat would not work, and my PC would not run the dedicated server. is the SQ program the solution? I hope to have a new release out this weekend, that hopefully fixes this issue. But as I can't consistently reproduce it, only time (and all of you), will tell. Please see this thread for a solution to prevent the problem (not fix it). On the last tab, uncheck the checkboxes for saving the console to the database and the chat to the database. Close and reopen RAT. You should be good.